Few artists make an impact as complete as the one Matisyahu made with his Top 40 hit “King Without a Crown”: Here was a true original, the song announced—a Hasidic Jewish musician from New York City singing reggae songs about his religious devotion. 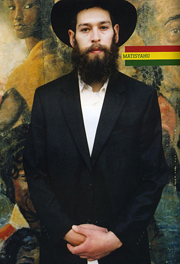 Fans responded to this one-of-a-kind voice, driving Youth, Matisyahu’s Grammy-nominated 2006 studio disc, to the top spot on Billboard’s reggae albums chart. That album, as well as Matisahu’s previous recording “Live at Stubb’s,” went Gold. His new album, “Light,” which debuted in the top 20 on the Billboard charts, is out now on Epic Records. Produced by David Kahne (Paul McCartney, Regina Spektor, Sublime), Matis recorded the album in Brooklyn, NY and Jamaica and got an assist from several guests Stephen McGregor, Sly & Robbie, members of Fyre Dept. and Fishbone, and others. The result is a bold new direction for an artist who has transcended cultures and genres. * check out “two child one drop” on his Shattered EP to hear one of the best Yemenite style hip hop tracks we have ever heard!